It works out well that I've had two college basketball cards made right around the time of the NCAA March Madness tournament. I didn't necessarily plan it that way, just good lucky timing. Unlike Tony Gwynn, I have known a bit about Dave Winfield being a two-sport college athlete. I was in awe when I found out (probably read it on the back of a baseball card) that Dave Winfield was drafted by the MLB, NBA, and NFL! The San Diego Padres took Winfield with the 4th overall pick in the 1973 MLB Draft. That same year The Atlanta Hawks drafted the 6'6" forward 79th overall in addition to being drafted by the Utah Stars (58th) in the ABA's draft. Despite never playing a single down of college football, the Minnesota Vikings saw enough raw athletic talent to draft Winfield in the 17th round of the 1973 NFL draft. Dave preferred America's Pastime in a move that culminated in a 22-year Hall Of Fame baseball career. Dave played two season of college basketball, 1971-72 and 1972-73. For the card I chose the 1972-73 Topps basketball design I used once previously with my Prince basketball card. For the image I wanted something that was a posed picture seeing as Topps used that type a picture as opposed to an action shot that year. I love the image even if it took forever to crop out just right. It's black-and-white, but I think that adds for a more dynamic look when it contrasts the yellow background. The color scheme is that of the Atlanta Hawks from the '72-'73 set seeing as Winfield was drafted by the Hawks. 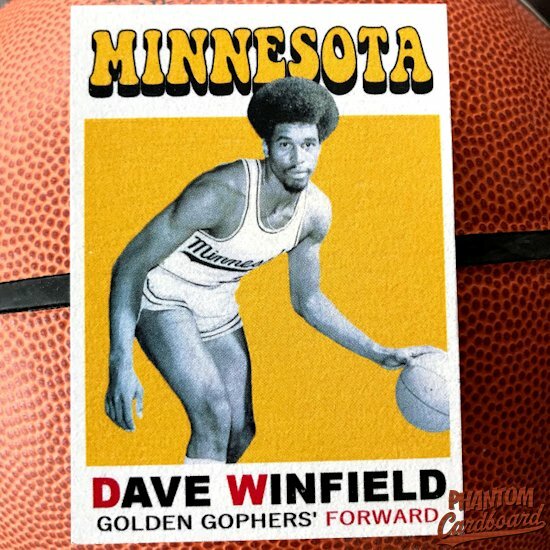 Dave was part of of Minnesota's 1973 Big Ten Championship team ... Winfield was part of one of the ugliest brawls in collage basketball history in a game against Ohio State in January 1972 ... was named MVP of the 1973 College World Series -- as a pitcher!